Most theme parks are outdoors and are only open during warmer times of the year. A few indoor theme parks, however, offer roller coasters, carousels, dark rides, and other amusement park fun year-round in a weatherproof, enclosed environment. A number of facilities may describe themselves as indoor theme parks, but the modest Chuck E. Cheese's-style attractions often have a handful of small rides, arcade games, and other features that would be better characterized as family entertainment centers. Let's run down the best indoor theme parks. At an impressive 925,000 sq. ft. (that's over 20 acres, folks), Ferrari World is the world's largest indoor theme park, and arguably the best. It showcases the legendary Italian automaker through sophisticated attractions and leading-edge theme park technology. It also plays off of Ferrari's racing prowess with coasters and other thrill rides, including the world's fastest roller coaster, Formula Rossa. Nickelodeon Universe is a full-fledged amusement park with three coasters, a giant Ferris wheel, and a slew of other thrill and kiddie rides. Sure, the coasters aren't of the extreme, bugs-in-your-teeth variety (then again, there are no bugs inside the mall). But there's plenty of fun to be had -- especially if you'll take a ride on a roller coaster over a mall shopping spree any day. Although not directly affiliated with the Mall of America, Water Park of America indoor water park is around the corner. The Adventuredome packs a fair amount of attractions into its 5-acre footprint. The highlights are the two steel coasters, Canyon Blaster and El Loco. Other attractions include Lazer Tag, a 4-D theater, the Sling Shot freefall tower, bumper cars, and kiddie rides. 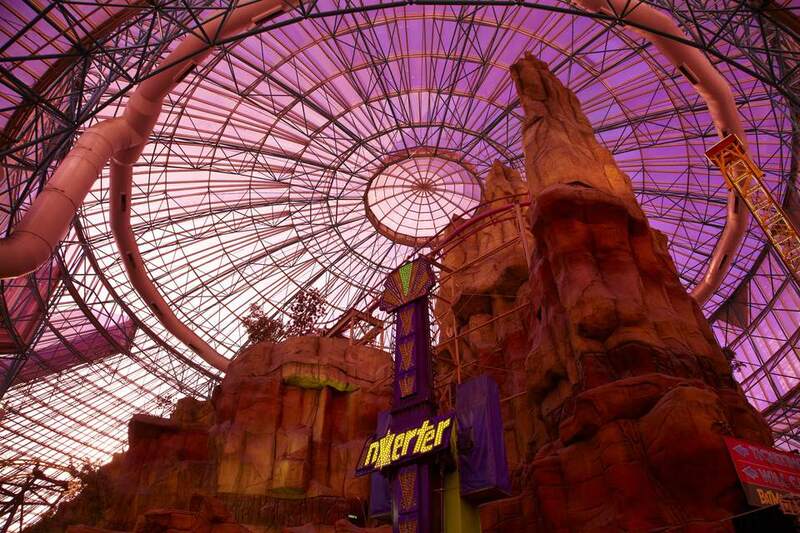 The Adventuredome is not a full-day experience, but it can be a fun diversion from the casino action. Hey, it's cold in Canada! That's why this park is tucked inside the climate-controlled West Edmonton Mall (one of the world's largest, by the way). Among its highlights is the Mindbender, billed as the world's largest indoor triple-loop roller-coaster (as if there are many -- or any other? -- indoor triple-loop roller-coasters). The park offers 28 other rides. Another attraction at the mall is World Waterpark, a massive indoor water park. A massive indoor theme park, Lotte World features Pharaoh's Fury, a sophisticated dark ride, Atlantic Adventure, a themed coaster/flume hybrid ride, and Gyro Drop, a freefall tower ride. Each day, the park presents World Carnival Parade, a 30-minute show with music and dancing from around the world. The Parthenon indoor theme park is comparatively small, but it does offer year-round, weatherproof rides on its mini coaster, bumper cars, and go-karts. Mt. Olympus is also home to Medusa's, a 55,000 square-foot indoor water park, Neptune's outdoor water park, and Zeus' outdoor theme park, which offers a great collection of wooden coasters and go-kart tracks. The Mt. Olympus resort also includes two themed, on-property hotels: Hotel Rome and Mykonos Village. While there aren't a heckuva lot of indoor theme parks, there are tons of indoor water parks. Some of them are enormous and provide as many attractions as major outdoor water parks. Indoor water parks offer another way to have weatherproof park fun. The majority of indoor water parks are connected to hotels and are packaged as self-contained resorts.